George Opdyke was a fighter. That quality had served him well in careers in retailing, manufacturing and banking and worked in Ohio, Louisiana and New Jersey. He “had risen from a journeyman tailor in New Orleans to be one of New York’s wealthy merchants. He had served in the legislature, where he had shown a knowledge of commerce and finance, and in 1859 had been the Republican candidate for mayor. He was a radical and a leader of the anti-Weed faction of his party,” wrote historian Sidney David Brummer.1 Opdyke, a dry-good merchant, was also a self-styled economist who authored a Treatise on Political Economy in 1851 in favor of free trade, free labor and inconvertible paper money. Salmon P. Chase relied on Opdyke in early 1861 to help advance his aspirations for a Cabinet post after he visited President-elect Lincoln in Springfield in early January. Chase himself went to Illinois in to confer with President Lincoln on January 4 and 5. According to Chase biographer John Niven: “When Lincoln saw Chase off on the train he had made up his mind that it was ‘not only highly proper, but a necessity, that Gov. Chase shall take that place [the Treasury].’ As for Chase he may have been noncommittal with Lincoln about accepting the Treasury post, but his actions belied his words. While his railroad car moved along between Springfield and Lafayette, Indiana, he scribbled letters to Opdyke and to [Hiram] Barney which a fellow passenger who was getting off at Toledo agreed to mail. In his anxiety to make sure that immediate action was taken and fearful that Opdyke might be out of town, he authorized Barney in that event ‘to open Opdyke’s letter and read it.’ What he wanted was to have his New York friends visit Springfield and impress his availability on Lincoln. ‘What is done must be done quickly and done judiciously,’ he wrote, ‘with the concurrence of our best men and by a deputation to Springfield. '”3 A group including Opdyke and Barney soon left New York for Springfield. In December 1861 Opdyke was very narrowly elected mayor because of a split among Democratic factions. Incumbent Fernando Wood tried to paint Opdyke as an abolitionist. Opdyke tried to associate himself with the War effort. Historian Burton J. Hendrick wrote that the New York banker was elected mayor “largely by virtue of the political strength his associates had obtained from the Federal government,” primarily in the Customs office.6 According to historian John William Leonard, Opdyke “was, during his administration, especially active in such measures as the municipality could initiate or aid, connected with the furtherance of the Union cause. Private benefactions and efforts continued along the same line. Mrs. Valentine Mott headed an association of ladies which opened, May 2, 1862, a Home for Sick and Wounded Soldiers in the building at Lexington Avenue and Fifty-first Street, which had recently been erected for an Infants’ Home, the home giving accommodations for from four to five hundred soldiers. Mount St. Vincent, in Central Park, was another institution of the same kind.”7 Opdyke’s power, however, was limited by Democratic control of the City Council. Mayor Opdyke, who had strongly supported the Lincoln Administration’s draft policies in New York City, played a central role in suppressing the Draft Riots of July 1863. He worked with the city police commission and federal government to put down the rebellion and to block any attempt at commutation. The Mayor also blocked bills passed by the City Council which would have exempted City draftees by paying their $330 fee to be exempted from the draft. That did not mean that Opdyke gave up political activities. Opdyke took a prominent role in seeking President Lincoln’s replacement on the 1864 Republican ticket. 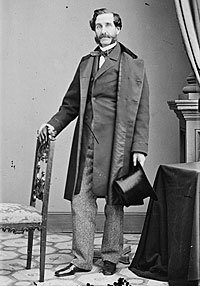 Historian Allan Nevins wrote: “When ex-Mayor George Opdyke of New York signed letters in mid-August  inviting Republican leaders to a meeting to discuss the withdrawal of Lincoln in favor of a stronger candidate, he met a remarkable body of support. This honest but commonplace clothing merchant was of course merely a catspaw. The real movers of whom [Congressman Henry] Winter Davis was the most determined, stood behind him.”12 The movement collapsed by the beginning of September. The trial opened in New York Circuit Court on December 13, 1864, before Judge Mason. Both principals were there, Weed’s calm, benevolent appearance contrasting sharply with that of the irritable, fussy Opdyke…. For almost a month the opposing counsel badgered a succession of witnesses, wrangled with the Court, and fought with one another. A vast amount of testimony was taken, some of it to the point, most of it characterized by prolixity rather than by relevance to the charges. Then on January 11, after the lawyers for the defense had pointed out how completely Weed’s accusations had been substantiated, and the lawyers for the plaintiff had pointed out how libelous had been every charge that he had made, the jury of twelve good men and true agreed to disagree. Allan Nevins, The Emergence of Lincoln: Prologue to Civil War, 1859-1861, Volume II, p. 274. John Niven, Salmon P. Chase: A Biography, p. 226. Burton J. Hendrick, Lincoln’s War Cabinet, p. 44. Michael Burlingame and John R. Turner Ettlinger, editor, Inside Lincoln’s White House: The Complete Civil War Diary of John Hay, p. 81 (September 10, 1863). Leo Hershkowitz, Tweed’s New York: Another Look, p. 92. William Alan Bales, Tiger in the Streets: A City in a Time of Trouble, p. 148. Glyndon van Deusen, Thurlow Weed: Wizard of the Lobby, p. 313. Sidney David Brummer, Political History of New York State During the Period of the Civil War, p. 388. Glyndon van Deusen, Thurlow Weed: Wizard of the Lobby, p. 314-315.